Bed bug problems don’t have to be stressful. We’ve got you covered with our bed bug spray buying guide, which presents you with the top ten bed bug sprays we found on the market today! All of the products on this list are exceptional and will help you easily get rid of your bed bug problem! But before we get started looking at them, let’s take a look at some things you should know. 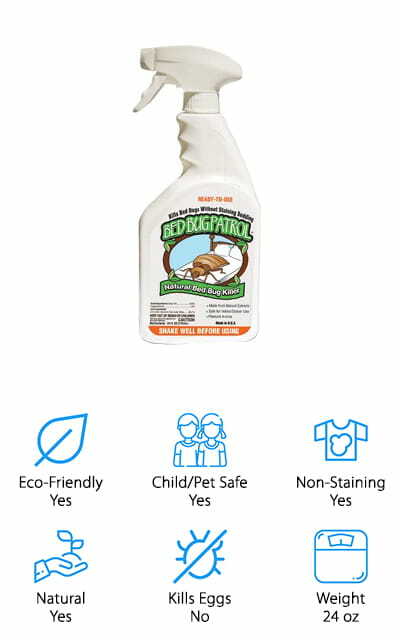 Eco-Friendly: It’s important to use a bed bug spray that isn’t going to harm the environment. After all, we have to share this Earth together! These products are usually all natural and free of harsh chemicals. Child/Pet Safe: If you have kids and pets, it’s also important to make sure that the spray you’re using won’t harm them. These sprays can be used when the whole family is in the house and won’t cause any problems. Non-Staining: Water-based sprays usually won’t stain your linens, which is important when you’re going to be spraying them down so much. You don’t want to have to throw everything out, which is where these products come in handy. Natural: A natural spray is going to put your mind at ease by containing none of the harsh chemicals that are toxic to members of your family. All-natural ingredients can still be effective, as seen here! Kills Eggs: You want to kill the bed bugs at the source before they even have a chance to start crawling. These sprays will kill the eggs as well as adults and nymphs, allowing you to stop an infestation effectively. Weight: How much product are you getting? This refers to the size of the package so that you can tell how much you’re going to need. For bigger infestations, you should buy more product for a larger area. Now that you know all that there is to know about the poisons, we can show you the bed bug spray reviews. We’ve left out products that didn’t work or weren’t effective enough, leaving you with only the best! Check out our top pick and budget pick first to give you a great idea of what’s available, before looking through the rest of the products, as they’re all pretty amazing! Let’s get started! What is the best bed bug spray? 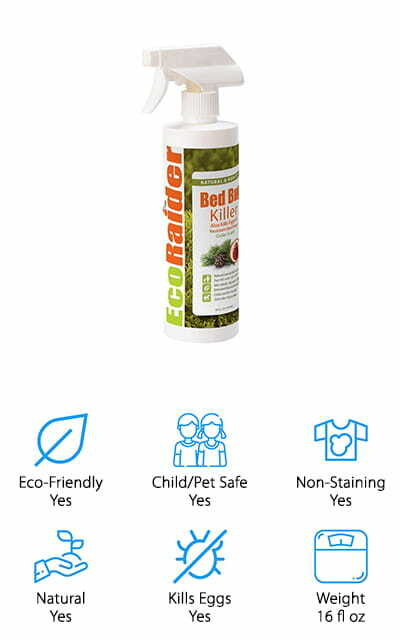 That’s up to you to decide, but our choice is this Bed Bug Killer by EcoRaider. 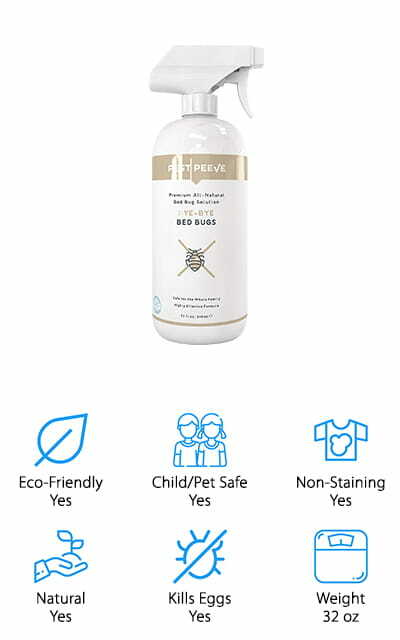 It’s a completely natural bed bug solution that won’t stain your clothes, beds, or other linens while still delivering the power to get rid of adult bed bugs, nymphs, and eggs on contact. You can also feel completely safe using it around your pets and kids because it’s made with all-natural ingredients. It works well no matter how infested the area is, from early prevention to heavy infestations that you think you might never get rid of! It’s a green product that kills immediately on contact. We love that it’s completely non toxic to humans and will extend the protection it gives for two whole weeks, so you can worry about other things! This was even voted on as the best bed bug killer by the Entomological Society of America, so you know it works! 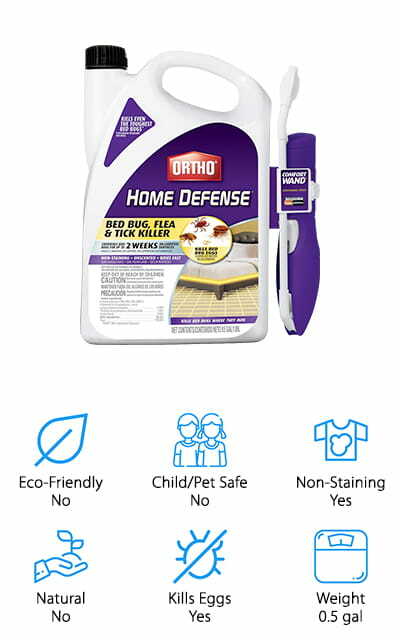 Our choice for the best cheap bed bug spray is this Ortho Home Defense product. Ortho has been a trusted name in pest control for years, and Home Defense really lives up to the company name! It is a fast-acting formula that will work for a long time to keep bed bugs under control. You can use it on beds, naturally, as well as other furniture and luggage after you come back from a hotel, just in case. It kills bed bugs and eggs, so it works at every stage. It also kills bed bugs that are resistant to pyrethroid, which sometimes happens in large, urban areas where the bugs have developed a resistance to more common pesticides. Bed bugs are already difficult to kill, so get the spray that’s going to kill them effectively! This cheap bed bug spray is great at keeping your home protected no matter where the bugs are hiding out. 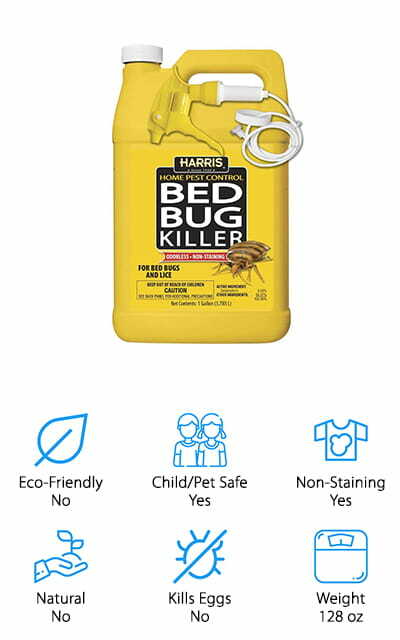 This Harris product is one of the top bed bug sprays that we found! What’s great about this product is that there’s an entire gallon here, which is enough to give you quite a few applications and keep your home bed bug free for longer. 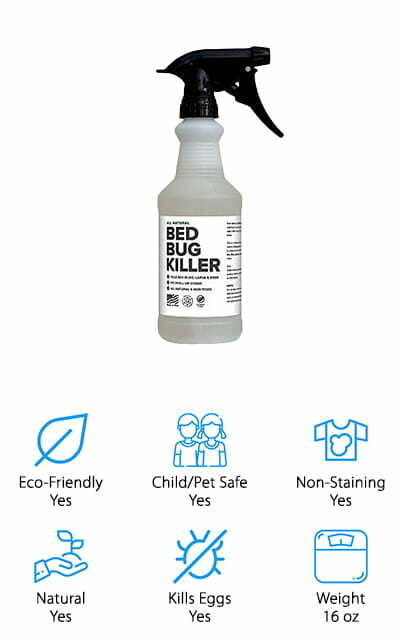 The nozzle comes with an extended trigger spray, so you can get the product even into those deep places where bed bugs hide. It will start killing the bugs immediately after it dries, and continues for several weeks. For best results, you should reapply every few weeks and give everything a thorough spray down to keep them from coming back. It has no odor, and won’t stain your bed or linens. And what’s better, it is EPA rated to be safe in homes with pets and kids. Getting rid of bed bugs has never been easier or more efficient, and as long as you let the spray dry, your bed bug problem will be gone! This effective bed bug spray by Bed Bug Patrol is great at killing all of the bugs that you don’t want to think about having in your house! It’s a natural pesticide that is completely natural and won’t stain any of the materials you spray it on. It’s scented with essential oils, peppermint, and clove so that it smells great and doesn’t leave behind any sort of chemical odor. It works quickly, becoming effective between the first thirty minutes after application and the following four hours. 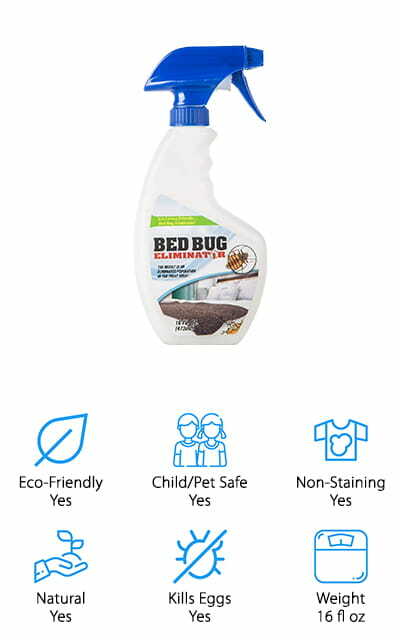 We love that even though it’s an effective bed bug killer, it’s also completely natural and won’t harm your kids or pets. It also comes in a travel size that’s approved for airplane travel in case you want to take it with you to hotels and other sleeping destinations. It’s made with essential oils, so it’s effective and it smells great as well. The quality of this spray is fantastic! One of the best home bed bug sprays on our list is this Killer Green formula. It’s a completely natural bed bug solution that is strong enough to be used by exterminators on the professional level. 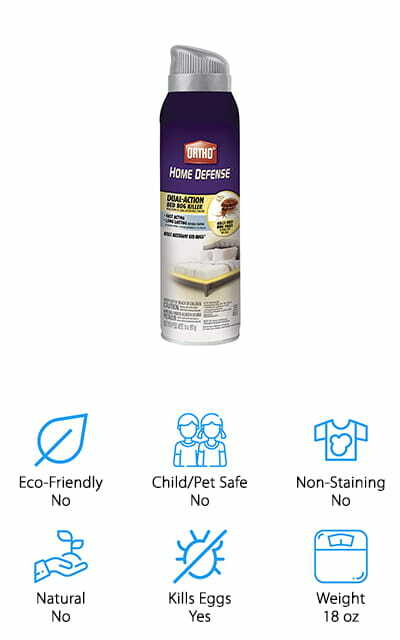 It’s a non-toxic spray that carries only a light smell that dissipates quickly, so you won’t be breathing in any harsh chemicals, and you won’t smell it at all when it dries. It’s fine to use around both your pets and your kids, and it’s non-flammable as well as an extra bonus. This biodegradable formula can be used on your pillows, bedding, toys – anything where bed bugs can take hold. For best results, spray it liberally on all of your linens, beds, and other affected areas – it kills on contact within 5 seconds, which we think is pretty amazing. Not to mention how you can use it without having to leave the house, and around your kids. It doesn’t get much more natural! Here we have another all-natural, eco-friendly bed bug spray that really works! It’s safe for your family, for your kids and your pets as well. But it’s powerful and fast-acting enough for you to recognize that the bed bugs are going away immediately. There is enough here to keep spraying for a couple of different applications so you are sure that they are gone and will stay gone. It won’t stain your bedding, curtains, mattresses, or even carpets, so you can rest assured using it anywhere. It’s made in the USA as well, so if you want to send money back into our economy, this is the product to try out. Plus they guarantee that if you still have bugs after using it, they will make it right. That’s awesome customer service! For being effective and green, this is one of the best bed bug sprays we found. Eliminate bed bugs at the source and don’t worry! Ortho is back on our list with their Home Defense Max. 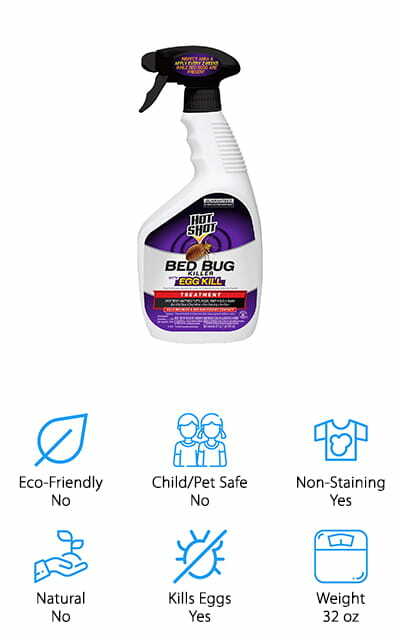 This is just like our best cheap pick, only it’s an even stronger formula that is designed to kill even the toughest of bed bugs. It helps to control bed bugs on even carpeted surfaces for up to two weeks – so for best results, spray every two weeks or so. It also kills eggs, so you don’t have to worry about new batches of bed bugs hatching. Make sure that you thoroughly spray every surface where the bugs might be hiding each time you do a treatment, and in no time the bed bugs will be gone! This even works on the ones that have developed a resistance to parathyroid, which is part of most other bed bug poisons. It won’t stain any of your fabrics and it’s the perfect formula to root out bugs at the source and prevent them from coming back. The first thing that’s awesome about this spray Is that it comes in not only the 16-ounce size, but it also includes a travel 2-ounce size for your convenience! You can use it around your fabrics, on mattresses and sofas, as well as on all types of carpeting and curtains. It not only kills bed bugs, but it kills their eggs, dust mites, and fleas as well, so it’s your all-purpose, complete pest killer. It’s completely non-toxic and safe to use around children and pets. It has a refreshing, natural scent that isn’t overpowering and won’t leave the lingering bug spray odor. We love that it has so many uses and kills so many pests, without having to buy separate pesticides for each one. That’s amazing! It won’t stain your bedding or any of your fabrics. For best results treat all the areas where bed bugs hide to completely root them out so they don’t re-infest your home. 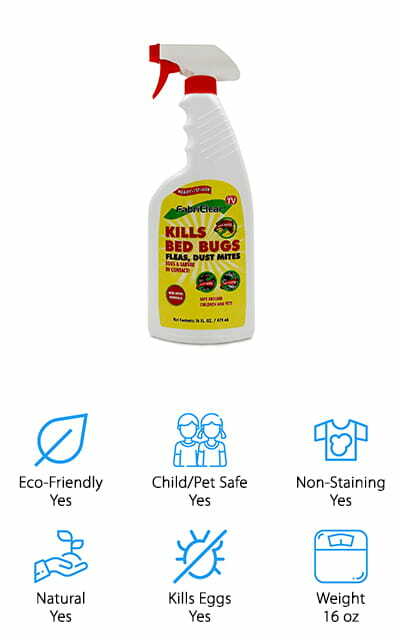 Hot Shot has been one of the most popular cheap pest control products on drugstore shelves for years, and this bed bug killer with egg-killing powers is no different than any other product by this company. It works, amazingly well! It kills all stages of bed bugs so that you are left with no stragglers when the treatment is complete. It’s a water-based, low-odor formula that will get rid of your pests. Spray it on your mattresses, all of the creases as well as on your bed frame, behind picture frames, and in dressers close by. They will hide anywhere there’s a crevice, so you have to make sure to spray the entire area. Only spray until damp and reapply every two weeks for the best results. It kills dust mites as well, which is a nice touch. Keep those unwanted pests out of your home and make sure they stay away with this spray! Don’t let bed bugs drive you away from a good night’s rest. This Eagle Bed Bug Eliminator is an all-natural solution to the sleep anxiety that can come once you realize that you have bed bugs in your home. It’s made from natural essential oils, which are eco-friendly and contain no harsh chemicals. In fact, they even recommend that you spray it on your skin before going to sleep to create a barrier between you and the bed bugs. It’s safe for your kids and your pets, so you don’t have to worry about having to leave the house when you treat the affected areas. It’s nontoxic and portable, so you can take it with you when you travel to avoid bringing anything home with you. We love the use of essential oils in this spray and the pleasant, non-chemical scent that comes with it. Kick those bugs out and keep them away for good.